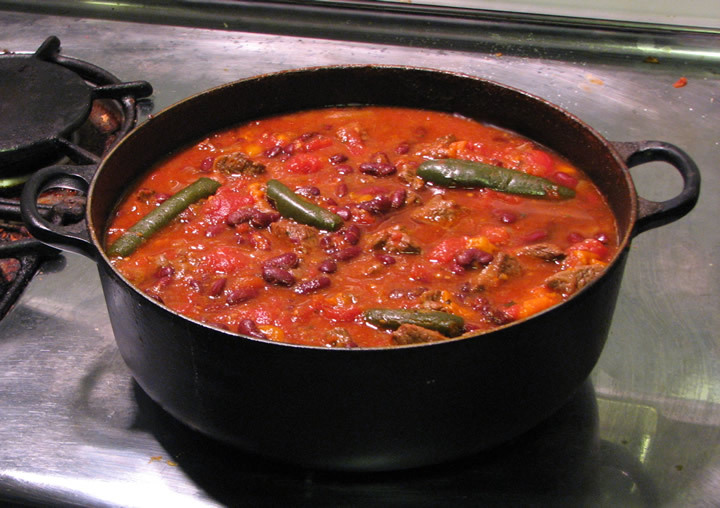 Chili con carne (literally "Chili with meat", often known simply as chili) is a spicy stew. The name "chili con carne" is taken from Spanish, and means "peppers with meat." Traditional versions are made, minimally, from chili peppers, meat, garlic, onions, and cumin, along with chopped or ground beef. Beans and tomatoes are frequently included. Left: Chili con carne with beans and tomatoes. Variations, both geographic and personal, may involve different types of meat as well as a variety of other ingredients. It can be found worldwide in local variations and also in certain American-style fast food restaurants. 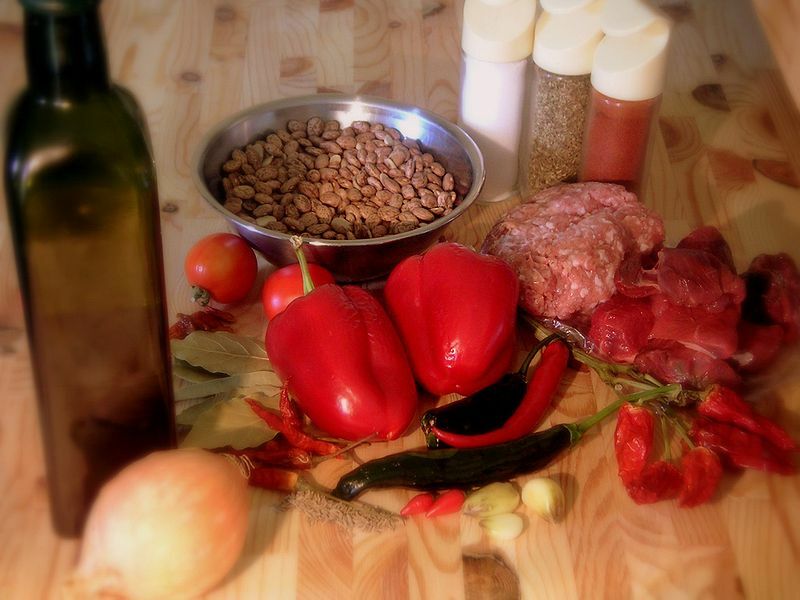 Left: Ingredients for Chili con Carne. 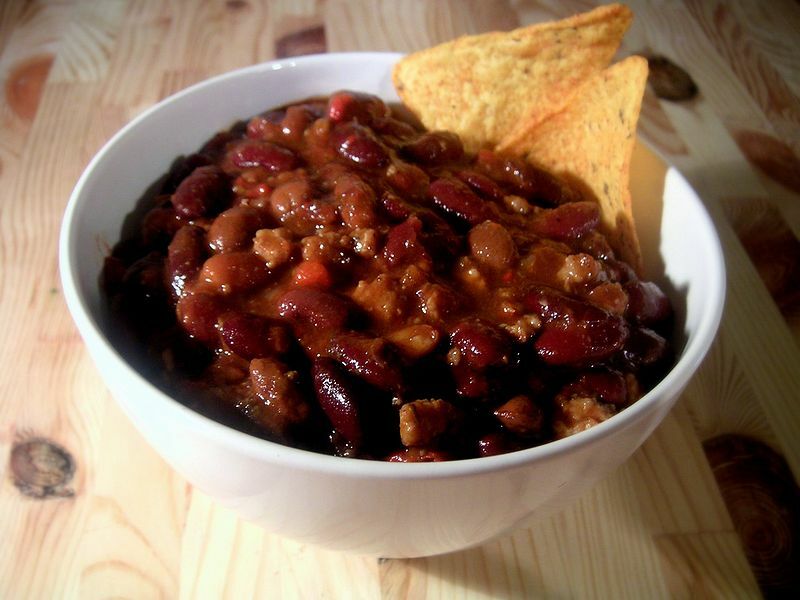 Vegetarian chili (also known as chili sin carne, chili without meat, or chili) acquired wide popularity in the U.S. during the 1960s and 1970s with the rise of vegetarianism. It is also popular with those on a diet restricting the use of red meat. 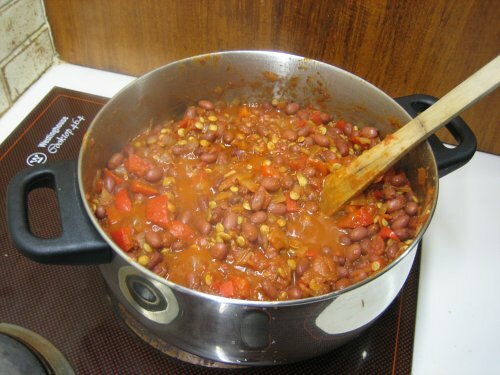 To make the chili vegetarian, the cook leaves out the meat or replaces it with a meat analogue, such as textured vegetable protein or tofu, or a complementary vegetable, such as potatoes. Variants may contain corn, squash, mushrooms, potatoes, and even beets. Corn, squash, and beans are known as the "Three Sisters" of Native American agriculture in the American Southwest. They were cultivated together, and complement each other as foods. Corn and beans together make a complete protein. Left: Pot of chili sin carne. Several beverages are commonly used to accompany a bowl of chili, including ice-cold beer, cola to provide a sweet contrasting taste, or a glass of cold milk to moderate the impact of the pepper on the throat. The dish may be served with toppings or accompaniments, including shredded cheese, broken saltine crackers, commercial corn chips, Jalapeño cornbread, rolled-up corn tortillas, and pork tamales. Left: A bowl of chili con carne with beans and tortilla chips.